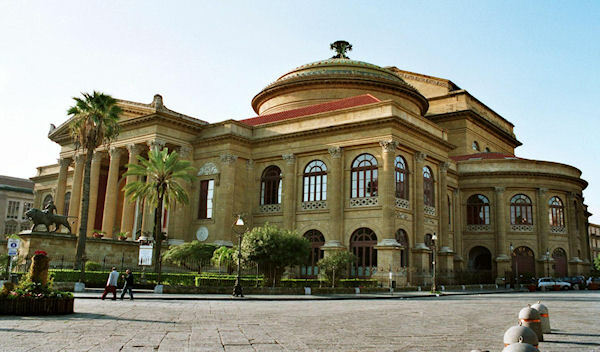 The walking tour of the city starts from the port of Palermo, where the guide will welcome you to Sicily. Walking along Via Emerico Amari, you’ll enter in Ruggero Settimo Street, the "living room" of the city, until Piazza Verdi. Here you’ll admire the majestic Massimo Theatre, which is the staircase leading to the entrance of the famous murder of the daughter of Michael Corleone in The Godfather Part III. After a short walk, you will enter the heart of the historic market, U Capu, where history, tradition and street food mix with the voices and faces of the people of Palermo, there you can find a newly restored baroque beauty, the church of the Immaculate Conception. Through alleys, palaces and ancient legends you come to the Norman Cathedral with the tomb of Frederick II of Swabia and the silver “Vara” of Santa Rosalia. Among the gardens of Villa Bonanno and the ancient ruins of the Paleopolis there is the Royal Palace which houses 3000 years of our history and the splendid mosaics of the Palatine Chapel in which the Arabs, Byzantines and Normans shared their knowledge, esoteric secrets, habits and life with great tolerance. Walking along the ancient fortifications you will take a picture of St. John of the Hermits, a beautiful Arab-Norman building, with its particular domes. Discovering medieval quarters, Spanish facades and courtyards of the historic mansions a surprise visit will introduce you to the Hebrew Palermo. Finally here you are at the Four Corners for a new cultural experience; visit St. Joseph of the Theatines, potent antagonists of the Jesuits. Returning via tax at the end of your tour.